Pizza steels are leaving pizza stones back in the Stone Age! Once word got out that slabs of steel conduct heat better and are more durable than stone, we had new questions – and new ideas – about how to use the steels. “Can a pizza steel be used on a gas grill?” was one that caught our attention. 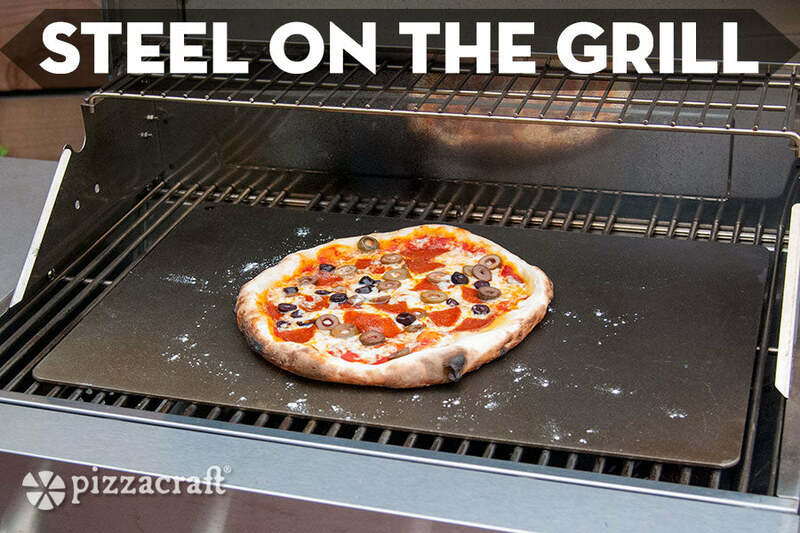 After all, when Pizzacraft was founded, the bulk of our products were for cooking pizza on the grill. Some rigorous testing was definitely in order! My main concern for this test was that the steel’s temperature would be too hard to control. Typically when I preheat the grill to run a test I use all five burners so I’m ready to cook within 10-15 minutes. With the pizza steel I knew I could always turn the heat up if the steel wasn’t hot enough, but if I overheated it, getting it back down to the right temperature would be much trickier. So instead of using all the burners during preheat, I decided to use indirect heat and turned on the three left side burners that weren’t directly underneath the steel. After 20 minutes the steel had preheated about to 290°F. I knew I still needed a bit more heat so I turned on the burners beneath the steel to low flame. After another 10 minutes, the steel had risen to 450°F and I was ready to test the first pizza. I prepared a pepperoni pie, opened the hood, and slid the pizza onto the steel. I closed the grill and set a timer, expecting the pizza to take at least 10-12 minutes. At the three-minute mark I checked in on my pizza, and to my surprise the crust had risen quite a bit. Even the bottom of the pizza was beginning to brown. I knew it wouldn’t take much longer for the pizza to finish. After another six minutes my pizza was done, taking a total of nine minutes to cook – pretty quick for a barbecue! With this experiment, there were two tools that really helped me reach the right temperatures and cook a nice pizza. The first tool is the infrared thermometer, which allowed me to closely and accurately measure the temperature of the baking steel as I preheated it. The second was the pizza screen. If the bottom was cooking too fast, I could just slide the screen under the pizza and keep the bottom from burning. And of course, I obviously needed a baking steel in order for this experiment to happen in the first place! Place pizza steel on the grill all the way to one side. Ignite all the burners that don’t sit under the steel and preheat 20-25 minutes. At 20-25 minutes, turn on the burner(s) below the steel to medium flame. Preheat another 10 minutes until steel is 450-500°F. Place pizza on steel, and check for doneness at 4-5 minutes. Rotate pizza 180° at least once during cooking. Pizza should take 8-12 minutes to fully cook. These instructions were written using a 9oz. dough ball. If you’re using more dough than this, expect a few extra minutes of cook time for your pizza to be done. Now that we know it’s possible, it’s time for YOU to test out your pizza steel on your backyard grill. You might just find your favorite new way to grill a pizza!